Our Health, Beauty and Wellness Classes offer a wide variety of courses to keep you happy and healthy. This comprehensive 60-hour EKG Technician Certification Program prepares students to function as EKG Technicians and to take the NHA – Electrocardiograph (ECT) Technician exam. This course will include important practice and background information on anatomy and physiology of the heart, medical disease processes, medical terminology, medical ethics, legal aspects of patient contact, electrocardiography and stress testing. Additionally, students will practice with EKG equipment and perform hands on labs including introduction to the function and proper use of the EKG machine, the normal anatomy of the chest wall for proper lead placement, 12-lead placement and other clinical practices. Health care is one of the fastest-growing employment opportunities in the U.S. PVCC’s Workforce Services Division offers specialized training for job-seekers wanting to obtain employment in the health care field. Stackable industry credentials such as Certified Nurse Aide, Pharmacy Technician, Registered Medication Aide, EKG Technician, Phlebotomy Technician, and others, can give you the necessary training to find stable employment and begin the ladder to advanced training and higher potential income. Our students receive more than the basic training needed to be eligible for these jobs, we also provide unmatched support systems to help you remove barriers to education and employment making PVCC Workforce programs the gold standard for health care training! Students interested in pursuing health care training through PVCC Workforce Services Division must attend an Information Session prior to enrollment. Information Sessions are held at the Jefferson School Center. Click here for directions. The sessions are held at the Jefferson School Center. Please note sessions last approximately 2 hours. Wednesday, Feb. 27 10 a.m.Wednesday, Mar. 6, 10 a.m.Thursday, Mar. 7, 5 p.m.Wednesday, Mar. 20, 10 a.m.Thursday, Mar. 21, 5 p.m.Tuesday, April 2, 5 p.m.Wednesday, April 3, 10 a.m.Tuesday, April 16, 5 p.m.Wednesday, April 17, 10 a.m.Wednesday, May 1, 10 a.m.Thursday, May 2, 5 p.m.
Would you prefer a day or evening class? 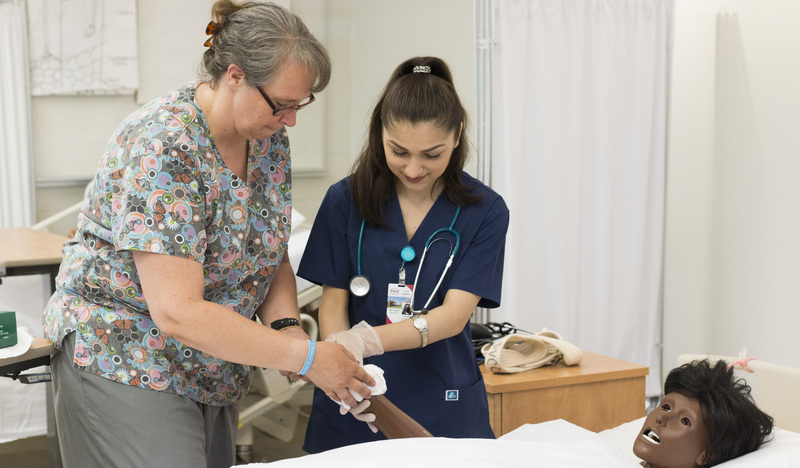 This 136-hour state approved noncredit class prepares you to take the Virginia exam to become a certified nurse aide (CNA) where you will work under the supervision of a licensed practical nurse, registered nurse, or physician as an entry-level nurse aide in a variety of inpatient and outpatient care settings such as long-term care facilities, physician offices, clinics and home settings. CNAs play a vital role in the health care team and are in critical shortage in our community. This class will prepare students who are currently enrolled and have satisfactorily completed at least one (1) clinical course in the nursing program (LPN or RN) which includes at least forty (40) hours of clinical experience involving direct client care or have completed a Virginia Board of Nursing Approved Nurse Aide Training class to take the Virginia Nurse Aide exam. The 6-hour class will review exam-specific test taking strategies, steps to accurately complete the skills assessment and registration/test day procedures so students will have better preparation for success in passing the exam. Financial assistance is available for those who qualify, please contact Community Self-Sufficiency by email at . This program will train students to assist physicians by performing functions related to the clinical responsibilities of a medical office. Instruction includes among other things preparing patients for examination and treatment, routine laboratory procedures, diagnostic testing, technical aspects of phlebotomy and the cardiac life cycle. Students will review important topics including phlebotomy, pharmacology, the proper use and administration of medications, taking and documenting vital signs, cardiology including proper lead placements, a professional workplace behavior, ethics and the legal aspects of healthcare. This program includes 166 hours of classroom lecture and hands on labs and a clinical externship opportunity at a local healthcare provider. To be eligible for the clinical rotation, students must successfully complete the 140 hour program, submit to a thorough background check, drug screening and meet other requirements. Prerequisites: Minimum age is18 and must have an academic high school diploma or GED®. This 65-hour Phlebotomy Technician Program prepares professionals to collect blood specimens from clients for the purpose of laboratory analysis. Students will become familiar with all aspects related to blood collection and develop comprehensive skills to perform venipunctures completely and safely. Classroom and lab work includes terminology, anatomy and physiology; blood collection procedures; specimen hands-on practice; and training in skills and techniques to perform puncture methods. Note: Upon successful completion of this program, students would be eligible to sit for the National Healthcareer Association (NHA) Phlebotomy Technician national examination. Note: In addition to classroom lecture and labs, this program includes a clinical externship through a local pharmacy. To be eligible for a clinical externship, students must successfully complete the 50 hour program, submit to a thorough background check, drug screening and meet other requirements. Students who complete this program will also have the opportunity to pursue the Pharmacy Technician Certification Board’s (PTCB) Exam. Prerequisite: High school graduate or GED® holder. Successful completion of PVCC’s Medication Aide Training program meets the requirements of the Virginia Board of Nursing for a student to be eligible to sit for the state exam to become a Registered Medication Aide (RMA). This program will cover topics such as: Legal and Ethical Issues, Preparing for Safe Administration of Medication, Introduction to Pharmacology, Administration of Prepared Instillations and Treatments (oral medications, eye, ear, nose etc. ), Documentation, Storage and Disposal of Medications, Special Issues in Medication Administration, and Insulin Administration. Students will be required to have 100% attendance in both class and clinical, a copy of their active, unrestricted Virginia CNA certificate, Background check*, drug screen and *PPD (negative TB testing) are required prior to start of class. Class meets during the day on Tuesdays and Thursday for 7 weeks.